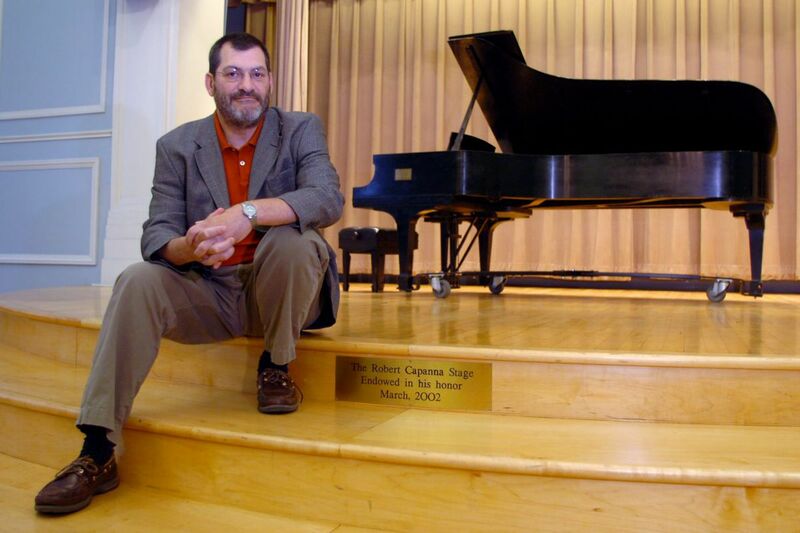 Robert Capanna, 65, executive director of the Settlement Music School for 27 years and a leading voice in the region's arts community, died Friday, Jan. 26, at home in South Philadelphia two years after being diagnosed with cancer. Widely admired for having a mind and ear equally sharp, Mr. Capanna took over Settlement in 1982, overseeing a period of expansion in the school's sites, programs, and student population before retiring from the job in 2009. At the same time, he worked to nurture the music community in numerous posts, including stints as president of the Presser Foundation and Musical Fund Society. A composer with a sustained output over nearly half a century, he was also a serious poker player. "He was a real Renaissance man," said Joseph H. Kluger, whose time as president of the Philadelphia Orchestra overlapped with much of Mr. Capanna's tenure at Settlement. "It is not easy to lead a complex, large nonprofit organization, and he didn't just sit there and maintain it. He built it, increasing branches and the scope of programs. For most people that would be enough, but he was also a composer and lover of life." "He was a model for someone who could in a single person be brilliant at many things," said Matthew Levy, executive and co-artistic director of the Prism Quartet, on whose board Mr. Capanna served. "He was a composer and a thought leader. He was so dignified and didn't suffer fools lightly, so he surrounded himself with people who were also passionate and committed and honest, and through those qualities he had this profound impact on the city and beyond. In his work at Settlement alone, he expanded this incredible institution in a way no one else could have imagined." Mr. Capanna was a composer in genres from chamber to orchestral to choral, and his works were played by the Philadelphia Orchestra, Milwaukee Symphony, Mendelssohn Quartet, Chamber Orchestra of Philadelphia, Orchestra 2001, Philadelphia Singers, and others. "Bob's music always keeps a listener totally engaged, which for me is perhaps the most important criterion for a good piece of music," said Linda Reichert, artistic director of Network for New Music, which commissioned and performed several of his works. "You can always understand where he is going and appreciate the formal structure, but you can still be happily surprised by unexpected creative turns. His music is smart, serious, and expressive, and often inspired by his wide-ranging interests, including mathematics, poetry, and the visual arts. " The Philadelphia Chamber Music Society commissioned six works from him over the years, and presented these and others by him. He also spoke about music at PCMS's pre-concert lectures, said the society's executive director, Philip Maneval. "He had that rare combination of a composer's care and sensitivity to music and musicians, and a clear-eyed, businesslike approach to the field, to how organizations can best function and thrive," said Maneval. "I think of Bob as very strategic and goal-directed, in the best sense, in the service of enriching and improving the lives of others." So it was at Settlement. Mr. Capanna worked quietly with faculty members to make sure students could overcome obstacles, said Patricia Manley, who has held various leadership posts at the school. Manley recalls a middle-school student who didn't have a piano at home and practiced on pianos at his school, during off-hours at Settlement, at his church, and elsewhere. "Bob arranged, anonymously, for a benefactor to make a piano available in the young man's home so that he could practice more readily," said Manley. The student has since gone on to achieve success as a conductor and educator, she said. "Bob's actions always reminded us that Settlement was a place for all people regardless of their musical capabilities, and that music was the means by which students learned lessons in managing their lives." Capanna in the lobby of Settlement’s West Philadelphia branch in 2009, with a work by Sam Maitin. Born in Camden, raised in Pennsauken and Merchantville, Mr. Capanna as a child traveled to Philadelphia for trombone lessons, and studied with Theodore Antoniou and Joseph Castaldo at the Philadelphia Music Academy, where he earned both a bachelor's and master's degree in composition. In 1974, he studied at the Berkshire Music Center at Tanglewood with Jacob Druckman and was awarded the Koussevitzky Prize in composition. He started at Settlement in 1976 as director of the Kardon-Northeast branch and became executive director in 1982. The director before him was Sol Schoenbach, the former Philadelphia Orchestra bassoonist, who was widely celebrated for advancing the school in his 24 years. Mr. Capanna continued the ambition — and multiplied it. In his time, the school's enrollment rose from 2,700 in 1982 to 15,000 in 2008; three new branches opened, in Jenkintown, West Philadelphia, and Camden; endowment grew from $1 million in 1982 to $10 million in 2008; and Settlement launched a chamber-music program for adults, expanded a program for advanced students, and started the Kaleidoscope Preschool Arts Enrichment Program, a daily arts program for low-income children. He was awarded an honorary doctorate from the Curtis Institute in 2008, and another from the University of the Arts in 2010. All the while, he composed, generally first thing in the morning before his day job, cataloging a list of works on a recent resumé of nearly five dozen since 1973. "He had something to say, and that is how he said it," said Cathryn Coate, Mr. Capanna's wife. "He was very focused, and he was also driven. He wrote music every day." Along with his own works in his catalog is a chamber arrangement of Debussy's Prélude à l'après-midi d'un faune that included harp. It was written for his first wife, Philadelphia harpist Karin Fuller, who died in 1990. After retiring from Settlement, he switched careers, becoming director for Prudent Management Associates, the Center City investment management firm, serving clients and teaching himself "a tremendous amount about the world of finance," said Paul D. Snitzer, general counsel at Prudent. "It showed what an adaptive mind he had for what was not the field that he had spent the better part of his professional career in." In addition to Coate, he is survived by son Stephen, daughter-in-law Katie, and grandson Nico; daughters Mariel and Cecelia; his mother, Maria; a sister, Phyllis; and members of the Fuller family. A visitation is set for Wednesday, Jan. 31, from 4 to 6 p.m. at the Pennsylvania Burial Co./Baldi Funeral Home, 1327-29 S. Broad St. A memorial service will be at a later date. Donations in his name may be made to the Philadelphia Chamber Music Society, 1528 Walnut St., Philadelphia, 19102; Prism Quartet, 257 W. Harvey St., Philadelphia, 19144; and Philadelphia Fight, 1233 Locust St., Philadelphia,19107.